Hello everyone we are still here. Much has happened this year and I for one am glad to see 2018 fade into the background and welcome 2019. Thank you for sticking with us. We’ve listened to your feedback and will make purchasing art easier in 2019! We wish you all a healthy & happy new year. It feels like 2018 flew by, as many of you have noticed Donna and I have both been extremely busy which unfortunately meant d+c contemporary was neglected for what seems like the entire year!!! But we are back and still completely committed and dedicated to making time for this passion project! In addition, in April I was offered a part-time/temp job with Mariestad’s Kommun ( a government job) I was literally in shock for the first 3 months because I have been looking, waiting and hoping for some type of part-time employment- and this job just happened to line up perfectly with my educational background and professional experiences. I was hired as the project leader for a pilot art and gardening program called Off Season Art Gardening and my responsibilities included contextualizing the program, developing an artist criteria, managing an artist call, establishing a jury, conceptualizing the brand, working with the three artists that were selected, curating online content, and marketing and promoting. I could not have even dreamed of an opportunity like this here in #mymariestad! And even though my part of the project has come to end I am incredibly tacksam for the opportunity I was offered to work with Mariestad’s Kommun because of the overall experience, the people I have connected with and the new partnerships that are just developing! Donna and I met while attending Howard University as graduate students in the art history department. We both focused on Caribbean and Latin American art and took a special interest with exile, expat and diaspora artists. We are passionate about migration and immigration! And I believe that D+C Contemporary has arrived to a place that will begin to tell a story about the expat art experience. This is a unique experience that reflects not only one’s history and roots but also a connection to the place that they call home (or their 2nd home). Moving forward the artists featured and the exhibitions will predominately, but not exclusively, explore the expat experience. And we are STILL incredibly grateful for all the artists, curators, and collectors that continue to inspire us! In Latin America and other countries, 25 November is a day to pay tribute to the Mirabal sisters as well as to globally recognize gender violence. On 17 December 1999, the United Nations General Assembly designated 25 November as the International Day for the Elimination of Violence Against Women. We organized our first 25 November art exhibition in Washington, DC featuring Carolina Mayorga several years ago. This year, we are so pleased to have participated in this important international event once again. We had a pop-up group exhibition in Barcelona, Spain. Paintings, photography, and video work by artists from China, the Netherlands, Spain, and the US were featured. All the artists currently live in Barcelona and agreed to donate a percentage of art sold to TAMAIA, a local social non-profit cooperative that assists women and girls who have experienced violence. Some of the art confronted aspects of violence straight on like Catalan artist Carla Gallén’s Family Portraits / Retrats de Familia whose digital paintings creatively and empathetically tackled the subject of gender violence by providing visual commentary on children murdered in Spain this year. We are constantly in awe of D+C Contemporary artists Bianca and Brenda Hofman (Barcelona Hofman). Through photography and ultrashort stories they are able to perfectly capture varying aspects of the human spirit. In Home Sweet Home, the sisters delved into the inner turmoil one may feel. In addition to the art exhibition, Joy Laking’s Invisible Prison monologues were performed. Laking compiled the monologues after interviewing women and men in Nova Scotia, Canada. The monologues were performed in English, Spanish, and Catalan thanks to the hard work of volunteer translators. D+C Contemporary would like to extend heartfelt thanks to Women’s March Barcelona, the UNiTE campaign, Joy Laking, and the volunteer translators for their assistance in making this event a success. The most wonderful time of the year has arrived and I have one question: where have the past 12 months gone? Donna and I started D+C Contemporary 2 years ago as a part-time (part-time) passion project - over the past couple of years it has slowly, but organically, evolved. I am so excited to approach the 3rd year because we have so many ideas that we will share in 2018 – many of them were inspired by artists that we covered and projects we did in 2017! D+C Contemporary pop-ups officially launched this year - the first one was in Mariestad, Sweden and the second was in Barcelona, Spain. Both events were successful and we are looking forward to more pop-ups and creating a pop-up experience online with the coming year. I am also excited about focusing more on studios (and how the word has evolved). We know artists who have created spaces in their homes, some with studios outside and some who have what we tend to think of as a traditional studio space. Both inside the studio and the new series the studio visit will explore the artist’s process and their tools. 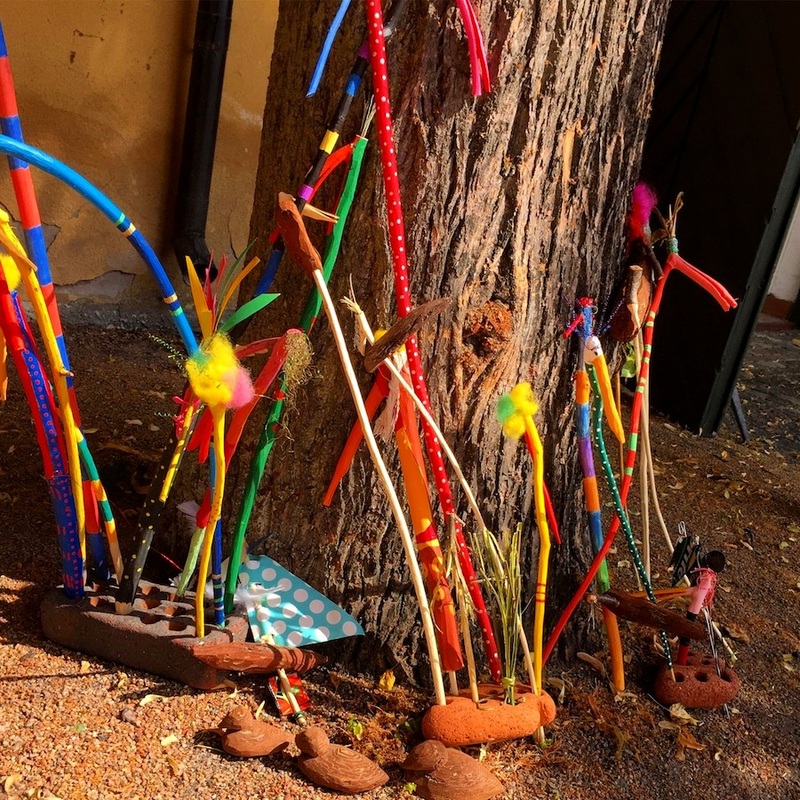 This year I attended Orbero’s Open Art Biennale – which was, as always, incredibly exciting -this biennale has inspired us to create an annual online public art experience. Easy Access: Public Art for All will take place during the summer months. We both believe that public art is such an asset to communities, cities and countries and this is our way of celebrating our appreciation for public art. Finally, as many of you might know Donna and I met while attending Howard University as graduate students in the art history department. We both focused on Caribbean and Latin American art and took a special interest with exile, expat and diaspora artists. We are passionate about migration and immigration! And I believe that D+C Contemporary has arrived to a place that will begin to tell a story about the expat art experience. This is a unique experience that reflects not only one’s history and roots but also a connection to the place that they call home (or their 2nd home). Moving forward the artists featured and the exhibitions will predominately, but not exclusively, explore the expat experience. We are incredibly grateful for all the artists, curators, and collectors that continue to inspire us! My favorite time of the year… fall! Though I actually enjoy certain aspects of all four seasons there is something so special about the harvest time. Fall welcomes shorter days with more cozy time. It is also the time for reaping the benefits of the garden that was started in spring and nurtured during the summer. In Mariestad, like many places around the globe, we celebrate hösttiden with a big culture and harvest festival that takes place at the end of September. This year is the 5th year, but 2 years ago during Mariestad’s Culture and Harvest Festival, I accidentally stumbled across an artist’s studio visit that left me feeling inspired by this small town that I now call home. Mats Westelius is what I consider one of Mariestad’s Masters, he has been creating art for over 35 years. Mats has a diverse portfolio that expresses his love for the sea, coastal/harbor towns and for his travels to Africa, Australia and throughout Europe. In addition, he has created multiple series of works that depict the fall harvest. Mats has exhibited professionally throughout Sweden since 1980 but this is his first online exhibition that promises international exposure. He is also represented by the National Museum (Stockholm), Moderna Museet (Stockholm) and Sjarfartsmuseum (Gothenburg). Donna and I are so excited about presenting this season's online exhibition which features a trip to Spain that Mats took during the fall of 1992-1993. Appreciating Coastal Towns in Spain is an exhibition of pencil and red clay drawings of the coastal towns Mats visited during this sojourn. In addition to the online exhibition, we are sharing snippets of Mats's studio you can see that here via Vimeo and if you are following us on Instagram I am sharing videos and live stories from the studio over the next couple of months. We are incredibly grateful that this season promises to be exciting because we are announcing our first popup exhibition that will take place during Mariestad’s culture and harvest festival – save the date September 29th – 30th. My Mariestad is a konst collabs (all female) event with D+ C Contemporary x Kreativ Collabs x Anna the Råw that features a few of our favorite D+C artists along with a few artists from The States and locally from (or connected to) Mariestad. We are hoping this is only the first of many more D+C popup exhibitions. And with a new season comes a refreshed platform. We want to make sure we bring more awareness to issues that are important to women and the expat experience. Carolina Mayorga, for My Mariestad, created a series of pink works that focus on Mariestad, but these works are part of a much larger series titled Pink: The Art of Infatuation and Embellishment. These works and this series are important reminders that October is the time to think pink and bring awareness to breast cancer. And as this exhibition will come to an end during the Thanksgiving holiday in The States we would like to wish all of you in The States (Thursday November 23rd), Sweden (actually referred to as tacksägelsedagen Söndag Oktober 8th) and Canada (Monday October 9th) a Happy Thanksgiving! Do you remember your first experience with public art? I remember mine like it was yesterday. I was about 8 years old and completely mesmerized by Dr. Virgil D. Cantini’s sculpture titled the Joy of Life (1969) , that was in front of East Liberty’s Presbyterian Church when I was growing up. Made entirely of steel it is a somewhat simple and clean construction, the base is a pedestal that is also a fountain – I remember during the hot, humid summer months it was always the most popular stop because of the cool mist that bounced off of the figures that are on top of the pedestal. The most striking part of the sculpture are 5-6 full body, lifelike structures that create a circle by linking arms together, this gesture represents the human connection and the idea of unity. I would often walk around the sculpture closely examining the geometric forms and the repeated characteristics of minimalism. This sculpture left an incredible impact on me as a young child and I looked forward to seeing it several times during weekly visits to East Liberty with Nana. Last December, Donna and I featured an end of the year review in which we highlighted Biennale visits during the summer. It turned out, our most memorable experiences were when we engaged with public sculptures, exhibitions, street art and installations. At that time, we discussed our appreciation for public art. Public art removes the notion that art is elitist, or even a luxury item because anyone and everyone can enjoy and discuss public art. Donna and I are committed to contributing to and promoting public art (and street art) throughout the States, Europe, and our travels. This month we are highlighting some of our favorite public art works. And I am thrilled to announce that because of our commitment to public art, every July we will share our favorite public works from Spain, Sweden, the States and our travels.Easy Access: Public Art features photos of public art, public sculptures and street art from our home country, the countries we both call home now and recent travels. We both believe summer is the best time to explore and experience public art. We encourage you all to hang out in your cities and towns a little bit longer to really engage with public art and seek it out during your travels. And please share your public art experiences with #easyaccesspublicart and we will show some #regram appreciation! If you are interested in public art, organizations such as: Public Art Fund, Public Art Agency Sweden, The Association for Public Art, Artscape Örebro Open ART (public art biennial), Street Art Barcelona, and Public Art Online are committed to public art projects and we recommend that you check them out and follow them via Instagram, Facebook and Twitter! Tell us about yourself. What does being an artist mean to you? I have always seen myself as a painter, when I was a child I use to look up at the clouds and wanted to paint them, now I am doing that. In periods it has been hard to keep up my work because of other circumstances. Now I am very glad that I have the opportunity to paint and do it so much more. Right now it is a bit of compact living, my studio is all around my 2-room apartment, mostly in the biggest room but also in the kitchen where the light is the best. Please explain the method behind your creative process. Originating from the background which I do with paintbrushes, then the strong color accents come in and is layed above, with the painting knife. I do not use so many different colors but the variations of the paintings are still very wide – surprise is always there, even for me. And when the picture is all there, I look to see what it says to me and set a title, that makes it complete to me. What inspires you to create? What role, if any, does identity play in your art? Please explain. When I paint I want to bring joy, harmony, balance and strength. I love to hear what different viewers see in the paintings, and then give them new titles. It is good to see when the imaginary world does magic. How does travelling or migrating (domestically or internationally) influence your creative process? I would say, none at all. When I travel, I mostly travel in my mind. I do not look at other paintings more than a very little. This is my world and it is quite unique. Is it important for your art to communicate a message? Please explain. My message is happiness and balance. Together with calmness that is what I want to bring to the viewers. In your opinion, what is the best city in the world to see art? I cannot say that, art is everywhere if you just see it. With which artist and in what location, would you like to have lunch? What would you order? Not sure about the artists…But I would like to go to Cuba, because there is a fabulous art of classic cars. Food? Well I will order pasta and probably from the vegetarian kitchen. It has been said that “art and wine go hand in hand…” Please talk about your wine of choice and the three artists with whom you would like to share it. Right at this moment why not champagne, with some intriguing Impressionists from the 19th century. Are you familiar with Basquiat (1996), Pollock (2000) and Frida (2002)? In the essence of these biopic films, whom would you want cast for your role? Please explain. Can I skip this question – I need more time to really think about that??? One of my most memorable gallery experiences when I first moved to Mariestad, was with Galleri Baggen. I discovered the gallery on one of my early morning jogs and though it was closed the windows were inviting and almost encouraged art voyeurs to peek inside, so I did just that! There was one work in the window that caught my eye and several works that I could see that looked interesting. As I continued to scope out the space I noticed a wall of colorful abstracts that were warm and inviting, I wondered if they were created by an artist with connections to the Caribbean – then I thought for a moment maybe Spain seemed more realistic since I now live in Sweden. These works seemed familiar because the purely abstract forms reminded me of Joan Mirò and Wassily Kandinsky but there was another element that kept me going back to view the paintings. During this time, I was researching various artists and art movements from Sweden and I saw a loose connection to the unacknowledged pioneer of abstract art Hilma af Klint. Hilma af Klint, like Mirò and Kandinsky, painted pure abstractions but she incorporated another aspect that explored spirituality. The more time I spent with these colorful abstracts, I started to see a connection with nature, so every chance I had, during that very cold spring, I would visit the gallery and absorb the warm energy from these abstract paintings. Finally, several months later I had the opportunity to meet this fictional expat Spanish artist now living in Sweden (at least this was the story I created in my head)! Art Crawl is one of the largest events in this small harbor town that takes place in the late fall during harvest celebrations. I walked around seeing several works and visiting so many art galleries and alternative gallery spaces hoping I would meet the artist whose work I had been admiring for several months. And finally, the last place on the map. I walked up a flight of stairs greeted by the most amazing colorful abstracts. And sitting on the sofa was a tall, lean woman with long black hair. I said hello in my beginner’s Swedish language explaining that I was not from Sweden but I had been living here for almost a year, studying the language and enjoying her group of works that were exhibited at Gallery Baggen. It turns out that she was definitely not from the Caribbean or from Spain, she was from Sweden and spoke English! We spent almost an hour, chatting about her work and the fact that she lived in Spain for many months. She lived in Fuengirola during the late 1980s. And it was upon her return to Sweden that she started to incorporate stronger and richer colors and this is her style today. Fast forward two years later, Ylvla Dimetri is exhibiting online for the first time with D+C Contemporary! We are incredibly excited to feature her in the exhibition Spain on My Mind. You can see the exhibition online from Friday April 7 – Saturday May 27, 2017 and after that @dccontemporary via Pinterest. Picture it. Something you really want is contingent upon someone else's positive reply. You think and plan. You prepare what you will say and how you will say it. Finally, the day arrives and you make your move. This was the experience of Bianca Hofman. The day arrived. She took a couple of works, walked into her neighbourhood gallery, and pitched an exhibition. The gallery owner agreed. Bianca and Brenda are sisters from The Netherlands. Brenda is a photographer and Bianca, an ultrashort story writer. They are expats living in Barcelona who have combined their artistic skills to create works that are visually engaging while delving into the human condition. In May of last year, the Hofman Project premiered 36 ultrashort flash fiction stories. Over cookies and cupcakes at a local cafe, I learned how the collaboration began. Three years ago, Brenda moved to Barcelona. Like many people who relocate, she immediately began exploring her new city. A key part of this exploration involved photographing her surroundings. Yet, when one views the images, the sites and scenes a visitor associates with Barcelona are not clearly evident. While walking the streets and alleyways of her new home, she was drawn to shapes, patterns, and light. She has a discerning eye. If something catches her attention, no matter how minuscule, the shutter is activated. After amassing quite a collection of photographs during the first year, she was anxious to do something with them. Already 'in love' with Bianca's stories, Brenda thought her photographs could serve as additional inspiration for her sister's writing. They each shared works, talked, planned, and the ultrashort flash fiction stories were born. "Everything inspires me; life inspires me", Brenda says and her sister concurs. Yet there are specific aspects of life that they gravitate toward in their art mediums. While the works are distinctly Barcelona, Bianca says, "we can show the other side of a city... We show our fears in our work." A testament to their symbiotic relationship and "similar vision" is that at times, Bianca shares one of her stories and Brenda says, "I have a picture for that." Their work is raw, poignant, honest, and dignified. It is without pretense. As Brenda comments, there are things that are "not so pretty about you and the people around you....life is a struggle." Photographing and writing stories about missing pieces, broken things, loneliness, and depression is a commentary on life. Yet the ways in which these topics are handled is worthy of note and calls to mind the I Give Everything Away series by French American artist Louise Bourgeois. In their work, the viewer is positioned as a close friend and confidant, privy to the artists' innermost thoughts and feelings. An intersubjectivity exists and through this, the realization that you are not alone. While attending my first pop-up art exhibition in Barcelona, I had the privilege of viewing the debut exhibition of the Hofman Project. Standing in front of the first artwork, I was intrigued. I became more emotionally drawn to each work as I recognized some of my own feelings displayed on the gallery wall. Bianca and Brenda are sisters from The Netherlands now living in Barcelona. Their creative collaboration began in 2016. Bianca’s stories and Brenda’s photography are like whispers of personal and private utterances told to only the closest friends. In this exhibition, they invite you to share in these expressions of human emotions, the pleasant as well as the wretched. I believe that everyone has the ability to be creative, and that when we give ourselves permission to be creative, we can change the world. My art is a learning tool for me. I use it to tap into my inner wisdom and express what I find difficult to put into words. Painting for me is a way to dig deep and discover what I have been feeling, as well as what I have learned over the years through spiritual growth and healing. Being an artist means communion for myself but also with others who share the same life experiences. When I paint I feel like I am vibing with the pulse of humanity, and feel connected to something. I also enjoy that I’m doing my part in showing other people that you can find a creative voice and hone it over time. I wasn’t always a painter, nor did I know how to draw in the early part of my life. I only discovered it as I allowed myself to explore my creative side, after having worked in the field of research for so long. What is your work space or studio like? Messy and mobile! Whenever I create, everything in my space becomes disorganized and in disarray, because my one focus is completing the work. I have a space in my living room with an easel, a desk, markers and art on the walls - for inspiration. However, I never create in that space. As a digital artist I create whenever and wherever I am and feel inspired. I actually carry my big laptop and pen tablet around with me just so I can paint. So in describing my real studio... It looks like open fields and mountains and trees because I frequent nature a lot, and like to paint there. And sometimes it looks like my messy bed, when I just woke up and my creativity is on the edge of my consciousness. The majority of my work is vector art, meaning I draw with a mouse using a computer program that translates my mouse strokes into mathematical patterns that become images. This is typically how I make my portraits. Starting out with a source photo, I use my mouse to draw a series of lines, points and polygons arranging them in such a way that I create the image I desire. Along the way, I apply various fills and textures to the shapes to create lines, shadows, and depth. Once I build my image, I apply varying combinations of computer effects to the vectors until I create my desired texture. Sometimes, I will paint on a substrate by hand, doodle a sketch or photograph an image and scan it into my computer and work from there, tracing over it, or using it as a background. I refer to this process as digital painting, as I work from a set of swatches I mix on the computer platform and the program’s brush palette to create paint-like textures. People in raw, honest moments when they think no one’s looking, and when they are coming into themselves, and owning who they are. This is the reason my focus is on portraiture. My body of work mainly explores issues related to womanhood, beauty, sexuality and identity as they are defined by gender roles, skin color, and racial identity. My goal is to find common ground across social constructs for race and gender by mimicking the techniques of the Fauves in a digital space. I rely upon either very vibrant colors or muted colors to express emotion, exaggerate skin colors and to explore the identity of the subject beneath the image. How does traveling (domestically or internationally) influence your creative process? I’m obsessed with natural settings, because they recharge and help me to go into a meditative place that allows me to access my creativity. One of my pieces, Attune is a self-portrait reflecting my experiences in natural settings. In that painting, a bird rests on my neck, speaking to me the secrets of nature and the love therein found. There is something about the stillness and quiet of nature, as well as the way plants/trees die and are born again, that grounds me and helps me to understand the flow of life which inspires me to paint. It is important for my art to communicate a message because my definition of art is that it is communication at its finest. It is a tool for finding the extraordinary in the hum drum and can express things that are difficult to articulate verbally. With that said, the messages I try to communicate through my art are meant to be felt not heard nor translated into words. It’s always great when a person can get my intended meaning behind the piece but it’s even better when they find their own meaning in the piece. That question is difficult for me to answer given that there are so many cities that are iconic hubs for art that I still need to visit. However, my painting style originated from the Fauves so based on that I would love to go to Paris to study the greats. Franciose Nielly, a knife painter from France, who paints with bold fluorescent colors and emotions. I probably would order a salad, because I would be too enamored to order anything else. Plus, I’d be eager to get back to the studio and study with her. Since my favorite artists and artistic style is inspired by French artists, I’d have to share a full bodied glass of quality French Bordeaux with Henri Matisse, founder of the Fauve movement, Paul Cezanne, who’s work inspired the Fauvism movement, and Martina Shapiro, a contemporary Jewish artist who paints in the Fauve style. I don’t know enough about these films to say but I think I identify most with Frida, who turned her disability into creativity. I have suffered from disabling depression over the years and often find myself in the bed painting to keep myself going. In a biopic about me I would cast Kimberly Elise who can connect with any character she plays and delivers emotionally stirring performances that touch people at a guttural level. She would be able to capture the depth of my feelings and emotions that I have worked through over the years, and healed through painting. Ana Beltrán Porcar is one of those people you meet and to whom you are instantly drawn. Her love of art is palpable. In addition to traditional gallery exhibitions, Ana collaborates with musicians to create symbiotic artistic concerts held in places of historical and cultural significance. Her latest "Veu la Música, Sent el Color" was held in the majestic Sala Alfons el Magnànim in Valencia, Spain. As her friends perform, she paints thereby creating a very organic event. By the end of the musical performance, Ana has completed a large scale painting. At these events, she is both artist and entertainer. As a recipient of the prestigious PROMOE grant, Ana was able to study fine arts at UABC (universidad Autónoma de Baja California) in Mexicali, Mexico. During this time, she completed the featured body of work Retratos de Mexicali | Mexicali Portraits. The city, as its name implies, is on the border of Mexico and California and is home to people from various cultural backgrounds. While there, she painted the daily life of its residents. Her work captures the individuality, humanity, and essence of each person. If you are in or near Tijuana, Mexico, be sure to visit the art festival Entijuanarte. Some of Ana's latest works will be on display from October 7th - 9th. In the meantime, please enjoy Retratos de Mexicali | Mexicali Portraits. Well, you know... it is just my room and the world. If you enter my room it is like a kindergarten room, with canvas all around, a lot of weird stuff like lights, elephant figures, pictures, mobiles hanging all over my ceiling, plants (I love plants) my computer and my ukulele. And the world an amazing chaos all around full of shine and darkness and chocolate. I think ideas are just hanging there in the magic of creation, waiting to connect with a creative mind. My creative process is working all the time, with the things I see, I read, I do, when I go for a run or drive hours in the traffic... My mind and my little Mexican body is keeping information, taking sensations, colors, sounds and then suddenly there's maybe a word, a phrase or another picture that produces a magic connection and my neurons scream "EUREKA" we got a great idea! Then I take that "sparkle" and begin thinking all around it. The best place for me to think is in the shower, it's like ideas + water = SUPERMAGIC. Then when I have the main idea, I go out and work on it, KABOOM! My main inspiration is life, the feeling of being a part of everything. The sensation of being so little in the big playground, to feel and identify with everything around. Traveling is the masterpiece in my creation. It opens in me all the possibilities, brakes all barriers and my ideas force me to be flexible and to see things in different points of view. To understand that the way I see life or I live it is not the only way. Then, it makes me feel like I am in an open field, with plenty of space to experiment and feel. Well, not a message literally but I think it must contain something that makes a connection to people maybe because it looks nice, funny, weird or colorful. Something that identifies with them or makes them think in different ways or feel any emotion. It must have humanity. Italy! Everywhere you look there is art, history, design, colors, even the sounds and the food. On the top of a very high building or a rock with Leonardo da Vinci. I would order a vegetarian dish full of colors and served in an unusual way, maybe vegetables that look like a big turkey inside a cage with wings. I don't like wine... hahaha! That is why I am just a creative mind no alcohol for me. But I would enjoy a really good and healthy smoothie with da Vinci or Escher. Emma Watson! I admire her commitment to the world, even having all the power and fame she still being a very conscious human and doing something good for the world with the high place she has in the industry. Also, she is very young and she keeps low profile… [She gets a] THUMBS UP! The day had been a bit stressful. Then I saw it. One of Alesol's paintings hanging on the wall of a local small business. I was mesmerized. Gradually, I became calmer; the day's stress began slipping away. I smiled. This was my first interaction with one of her paintings. Taking me from a state of agitation to one of relaxation in a matter of seconds. I asked the owner about the painting and found out the artist was a friend. After a few exchanged messages, I had an appointment to meet Alesol. The interview was unlike one I have ever had. Four languages were used, Portuguese, German, Spanish, and English. I am only fluent in one of these while Alesol is fluent in two. Unfortunately, we did not share fluency in a common language. Yet, the meeting proved to be completely enjoyable. While some things were lost in translation, she was able to express and I to understand her keen desire and love of painting. She sees painting as a way of contributing something positive to society. To aid in this regard, she often includes shades of blue. For Alesol, blue represents the sky and sea and thus is a relaxing colour with calming effects. When Cecily and I began d+c contemporary, we knew we wanted to curate an exhibition of Alesol's paintings. To my surprise, we are the first gallery to exhibit this talented artist. We are delighted to introduce Alesol and her beautiful paintings to a much wider audience. Cecily and I met in graduate school in Washington, DC. We studied art history as undergraduates and were continuing our studies at the graduate level. Our love of art, food, and wine cemented our friendship. We dreamed of one day having an art gallery and sharing our passion with others, but the cost of a physical gallery proved prohibitive. We both moved to Europe and although we lived in different countries, we kept in touch. Our dream of an art collaboration remained. Enter, 2015. Finally, our dream became a reality. We decided to follow in the footsteps of other online art platforms and D+C Contemporary was born. D+C Contemporary consists of two parts, a boutique online gallery representing a handful of international artists and the district: contemporary art journal, our online art blog. We launched both parts in October of this year. In our blog, we highlighted artists from Australia, Germany, South Africa, Sweden, and the U.S. On our gallery, we featured Joshua D Neidermeier in October and Carolina Mayorga in November. We are looking forward to a full year of exhibitions in 2016 where we will expand to bring you more of the things we love: art & travel, art & wine, and art from multiple countries. We welcome you to join us on our international art journey. Please follow us on Twitter, Instagram, and Pinterest. Tell your friends and family about D+C Contemporary. Have a great New Year & remember to support the arts! What an amazing year, I cannot believe it has come to an end so quickly! To think D+C Contemporary started from a creative Skype chat and has grown into a contemporary online gallery and art blog. We are definitely inspired by the Artsy and ArtStack platforms, and also love online galleries such as ArtShare, Tappan Collective and The Agora Culture. Similar in method, our goal is to contribute to online art galleries and platforms with a transcultural approach. We know so many amazing, talented, emerging, and established artists, curators and collectors from the States, but we are excited because by living abroad our network has expanded. We had the opportunity to attend three international art biennials this year. Donna travelled the farthest from Germany to Cuba and I attended two that took place right here in Sweden. 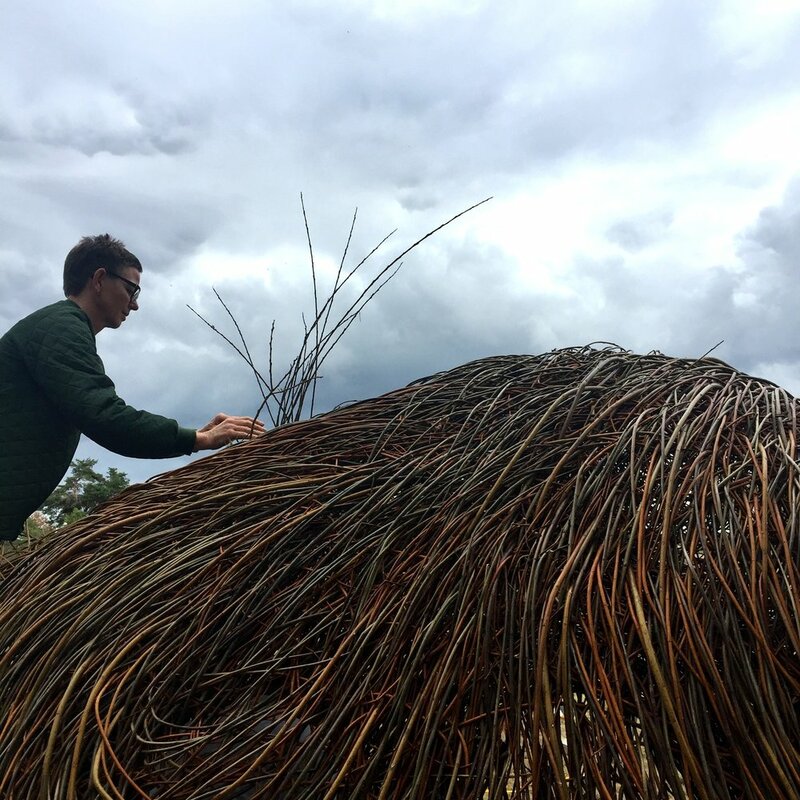 You can see highlights from our experiences at 2015: Biennial Highlights. The next online exhibition takes place early in the year and features an artist from Durham, NC. His works celebrate the music industry and also examine American pop culture. We will share more details during the holiday season. The District: Contemporary Art Journal has several essays featuring artists from around the world and we have new essays in the pipeline. There are artists from Scandinavia, Washington DC, Chicago IL, and Durham, NC whose stories I am super excited to share. We will also launch a new series titled Conversation with the Collector. So far, we have a collector from Washington, DC and one from Mariestad, Sweden. Donna and I will share bits of our collection as well. Inspired by our travels, we have started a new series titled Art Travels – there you can read more about Donna’s experience in Cuba. Later in the year, we will launch a podcast that focuses on art and wine. We want to say thank you to all of the artrepreneurs, curators, and collectors that inspire us. In 2015 we were just warming up. 2016 promises to be even more exciting, so stay tuned!! Wishing you all a happy, healthy holiday season and New Year! The Havana Biennial was established in 1984. This year marks its 12th installment. What started as a Latin American and Caribbean exhibition has grown to include artists from around the world. Yet, the Havana Biennial continues to be an important stage for non-European art. This year's event features 200 artists from 44 countries, and d+c contemporary was there. The Biennial is not confined to a single venue; instead, art is strategically exhibited throughout the city in galleries, museums, hotels, and other alternative spaces. The Hotel Conde de Villanueva, for example, showcases the photographs of Julio Larramendi. He captures the beauty of otherwise banal daily activities by focusing on the individuals' humanity. The courtyard of the Hotel Marqués de Prado Ameno proves a perfect space for Movimiento by Herman Skretting and Orlando Gutierrez Yedra. There is something poetic about the visitors' ability to freely move through the open space while viewing the images of two young boys interacting with their environment. The fact that the Biennial is not limited to a single exhibition locale transforms Havana into an open air museum. The city feels alive with art. Already culturally rich, the Biennial widens the possibility of encountering even more art at each turned corner. Throughout the city, there are sculptures paying tribute to important historical figures such as Jose Martí. Art is literally everywhere. A stroll to the Chocolate Museum is briefly interrupted as performers sing and dance in the streets. While walking through this teeming city, we happen upon the courtyard of Art is literally everywhere. A stroll to the Chocolate Museum is briefly interrupted as performers sing and dance in the streets.La Casa de Benito Juarez which is a museum that highlights Mexico's history, culture, and relationship with Cuba. I see this beautiful intricately designed mural. The Biennial along with the public and street art allows for a continuous flow of traffic inside buildings, courtyards, gardens, and public squares. An enclosed space is needed for the video installation Interrogatorio (2009) by Ignas Krunglevicius. This installation is one of the most provocative I have ever seen. In Interrogatorio, the 'unknown' is what makes it compelling. Victor Ekpuk's Meditaciones sobre recuerdos (2015) is a site specific work. His desire is "to create a contemporary shrine of memory of the Ibibio, Ejagham, Kwa, Efut, and Efik ancestors who were brought in slave ships to Cuba." Upon entering the room, the visitor has a feeling of constraint. The high walls and ceiling along with the rectangular shape of the room aid in this regard. The walls bear drawings of countless figures symbolizing individuals forced through the Middle Passage. Undulating lines representing ocean waves encase the room. While physically a drawing, Meditaciones sobre recuerdos is much more. According to Ekpuk, it is poetry, song, and incantation to honour "these ancestors in the Diaspora." At the end of the Biennial, the drawing is erased. This final act "exemplifies the notion of memory (identity) as [an] ephemeral condition that is contantly being affected, reshaped and redefined by circumstances." On our last day, soon after leaving the exhibition Transparencias featuring thepaintings of Isabel Bustos and José Eduardo Yanes, we encounter a performance by Danza Teatro Retazos choreographed by the multitalented Bustos. She is a painter and choreographer. I have the privilege of meeting Bustos and sitting next to her during the performance. As she watches the dancers, her body sways gently, her foot taps, and her hand raises and delicately sweeps up, down, and side to side. Her gestures are that of an orchestral director or, in her case, as that of a painter. With smiling nods of approval and subtle indications to adjust an article of clothing, Bustos remains connected with each dancer. Bustos embodies art. As I watch the performance, I feel that I am also experiencing one of her paintings. The sweeping movement of a brush and the swaying movement of a body. Each with careful and exact precision yet organic in its individual flow. It is art in motion, it is profoundly moving, and it is the perfect way to end our time in Cuba. The Havana Biennial is a great experience and d+c contemporary is grateful to have been in attendance. The first time I saw one of Antonio Carreño’s paintings, I was instantly drawn to it. The colours were the first to attract me, but then I became lost in the other worldliness of the painting. A duality existed upon the canvas. It was a painting, yet had sculptural elements. There were constructed dimensions, reliefs, and crevices. These grabbed my attention and then transported me into another sphere. The painting was mystical and, at the same time, completely familiar. Since my first introduction, Carreño’s style has changed, but the essence of his work remains. It is always dynamic and engaging. Inspired by the universe, many of his early works are texturally complex. He frequently used natural and man-made materials such as sand, sawdust, and ground paper as a foundation for the paintings’ tactility. In a universal way, we sometimes talk about the air as separate from the universe, but for me I look at the earth as part of the universe and most of the things in the universe are related to the earth. If we want to know the answers to the universe, we can look to the earth - its right in front of us. Carreño has mastered the technique of creating atmosphere. He works in layers and manipulates geometric patterns and colours to construct planes of existence. One quickly becomes captivated by the paintings’ visual dialogue. His paintings take the viewer on an expedition where one discovers more the longer one views the painting. The vivacity of the paintings results in the viewer’s inter-action with the art. Unable to focus one’s eyes on a particular area, the energy, movement, progression, and harmony within the work hold the viewer’s attention. He paints without constraints or limits. As such, painting becomes a spontaneous and experimental journey yet, seemingly contradictory, it is also controlled and deeply profound. I mix my colours and I start to work. I have a general understanding as to how I want to structure the different density of the colours. Most of the time I try to use more heavy colours on the bottom as it grounds the painting and then as I move up I use lighter colours. It’s just a psychological way of how we are ourselves. Your thoughts are coming through your head and you are grounded by the floor. The quality of things is much lighter on the top and heavier on the ground. In most of my latest work, I might have a different spectrum, where the finalities are harmonious around the paintings themselves. I always use a touch of primary colours, red and yellow. Yellow is light to me, it’s an important colour and I use it as light. If I’m using secondary colours there would always be the appearance of the primary colours, to reflect the energy of the painting itself. Carreño's use of colour is influenced by his cultural background. Light ... comes very naturally. I think growing up in the Caribbean, the main thing that hits you every day is the sun. No one in the Caribbean is separated from interaction with the sun. In painting, there’s energy between the art and artists in general. The energy of a painting has the energy of the artists. Carreño’s interest in humanity and the “driving forces” of our lives contribute to his body of work, Gravitation. This series continues his attention to the universe and humanity’s place within it. Scientists acknowledge that the universe is expanding, yet, they are unaware of exactly how this is occurring. The driving forces of the universe, in many respects, remain unknown as do the driving forces among individuals. It is this mystery Antonio seeks to explore. He states, “gravitation creates everything”. Gravitation is an unseen fundamental aspect of our daily existence in both a physical and social way. Just as our bodies are attracted to the earth through gravitation, there is also the magnetism which exists between individuals. This applies to strangers whom we physically gravitate towards for some unknown reason as well as mental gravitation, thinking of a person at a certain time and having an unexplained, yet urgent need to make contact. Carreño’s art, like the universe, expands with no end in sight. He continuously pushes himself and his art to express the holistic nature of the universe and the universal elements that connect us all. A lot of the information in the color is presented within the soul of a thing. Sometimes a painting as a whole will reflect feelings and emotions that can’t be captured. Colors can capture the emotion. It can be the end of the afternoon (or) the space of the ocean.